Planning a trip to Orlando and searching for July 2020 Florida flight prices? We have advance rates for all the popular airlines, including Virgin, BA, United and Norwegian. Call us on 01934 319 851 for our best price on July 2020 Orlando flights. Can you leave in the first week of July? It’s still the shoulder season and fares are very reasonable. Can you leave in the second week? Fares are still good value, even on direct flights. Peak fares don’t kick in until around mid-July. After 15th July, direct flights become more expensive. The best option is an indirect flight from Heathrow – savings are substantial. Fly from Gatwick. The major airlines have plenty of flights departing from Gatwick, so prices are competitive. Book early for good value on BA, Virgin and Norwegian. If possible, avoid a weekend departure. Tuesday and Wednesday flights are more economical. Book early. An advance booking gives us plenty of time to buy your seats at the best price. Consider an alternative arrival airport. Miami, Tampa and Fort Myers might offer better value on peak dates. Need to fly on peak weekend dates or during the school summer holidays? Heathrow’s indirect flights offer excellent value. The changeover adds a few hours to the journey, but the savings are worth the inconvenience. Manchester, Glasgow and Edinburgh also offer indirect flights at a decent fare. Contact us for our best price on indirect Florida flights July 2020. We almost always achieve great fares to Orlando International. On peak dates, Tampa, Miami or Fort Myers sometimes offer better value. Let us know if you’d like to consider an alternative arrival airport. Don’t want to depart from London, Manchester or Glasgow? We book connecting flights from smaller UK airports for a supplement. Belfast, Aberdeen, Inverness, Edinburgh, Isle of Man, Newquay, Exeter and Jersey all have convenient schedules. They connect into the Virgin or BA network – your luggage is automatically checked through to Florida. How much do you expect to pay for your July 2020 Orlando flights? High Street prices exceeding £1000 are typical for peak dates in July. Follow the tips above and you could achieve prices of around £545 per adult and £495 per child. We achieve great-value fares without compromising on quality. We book with reputable airlines including BA, Virgin, United and Norwegian. Our technique is simple; we monitor fares daily and use experience to judge when prices hit rock-bottom. This allows us to provide excellent advance fares to our customers. Book now for good-value July 2020 Florida flights. Fares are released 11 months before departure date, but don’t wait until then. Advance book with us now. An early booking gives us plenty of time to find the best fare. Add car hire to your booking for a great-value July 2020 Florida fly-drive. Or why not book a full package holiday at an excellent rate? Browse our 2020 Florida holidays page for inspiration. Book your July 2020 Orlando flights now with a deposit of £100 per person. The balance is payable 90 days before departure. All our July 2020 Florida flights and holidays are ATOL and ABTA protected. 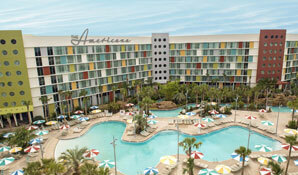 Fly Virgin direct to Orlando and stay for a fortnight at Universal's Cabana Bay Beach Resort. Car hire included. Depart before 16th July to take advantage of this well-priced July 2020 Orlando holiday. The Cabana Bay Beach Resort is perfect for a family holiday - facilities include two large swimming pools, a water slide and a bowling alley. Both of Universal's theme parks are within walking distance. Book now with a deposit of £100 per person, ATOL and ABTA protected.